The world is on the brink of the greatest crisis it has ever faced: a spiraling lack of fresh water. Groundwater is drying up, even as water demands for food production, for energy, and for manufacturing are surging. Water is already emerging as a headline geopolitical issue—and worsening water security will soon have dire consequences in many parts of the global economic system. Directed by UN Secretary General Ban Ki-Moon at the 2008 Davos Annual Meeting, the World Economic Forum assembled the world’s foremost group of public, private, non-governmental-organization and academic experts to examine the water crisis issue from all perspectives. The result of their work is this forecast—a stark, non-technical overview of where we will be by 2025 if we take a business-as-usual approach to (mis)managing our water resources. The findings are shocking. Perhaps equally stunning are the potential solutions and the recommendations that the group presents. All are included in this landmark publication. 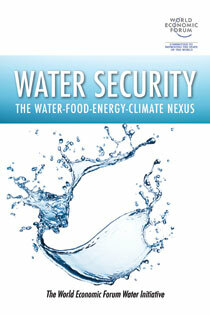 Water Security contains compelling commentary from leading decision-makers, past and present. The commentary is supported by analysis from leading academics of how the world economy will be affected if world leaders cannot agree on solutions. The book suggests how business and politics need to manage the energy-food-water-climate axis as leaders negotiate the details of the climate regime that replace Kyoto Protocols. "Despite its relative brevity, the book is successful in disentangling the complex web of interactions that characterizes the water-food-energy-climate nexus...The brief, factual examination of the socioeconomic implications of current water usage trends in many sectors of the world economy is nicely complemented by commentaries from academic experts, business leaders, and public officials...In presenting multiple perspectives the book provides a broad and diverse set of opinions, which is appropriate for an undergraduate audience or for readers looking for a point of entry into the pressing issue of global freshwater management." "Island Press editors have achieved a nearly impossible task....The World Economic Forum Water Initiative and Island Press is to be congratulated for raising awareness of complex and interdependent future water needs and the impacts on economic and social security if these needs are not met." "It is a book written by a committee, but it gets the story right. Even its title makes the case that water, food, and energy are woven together inextricably to form the very web that sustains human existence." Step 2: How Can the Gaps between Supply and Demand Be Closed? Step 3: What Technical Options for Supply and Water Productivity Exist to Close the "Water Gap"? So, How Will This Initiative Work?